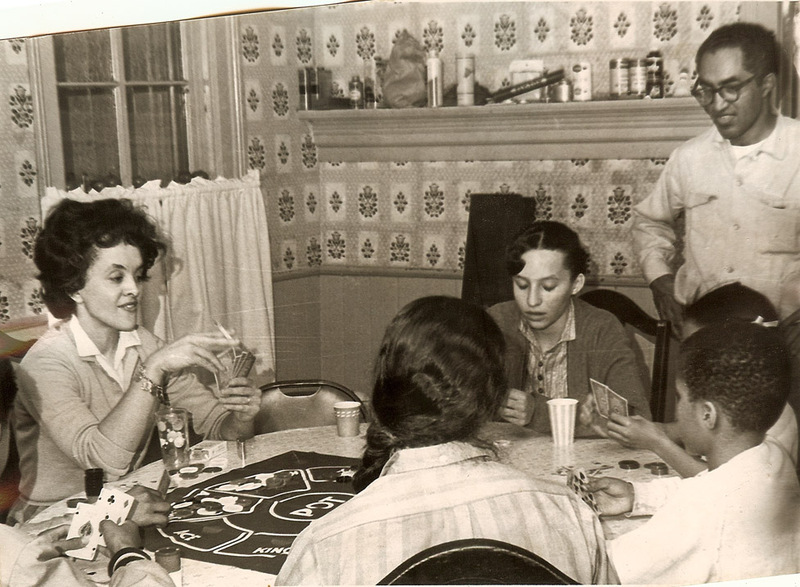 Playing poker – my aunt Gladys with cigarette, me, my uncle Hugh, cousins Jan and Dale, my mother. Still playing poker – my mother with glasses, cousin Warren, cousin Ernie, aunt Gladys, cousin Jan and cousin Dale. The house on Old Plank Road. Between Milford and Wixom Michigan. 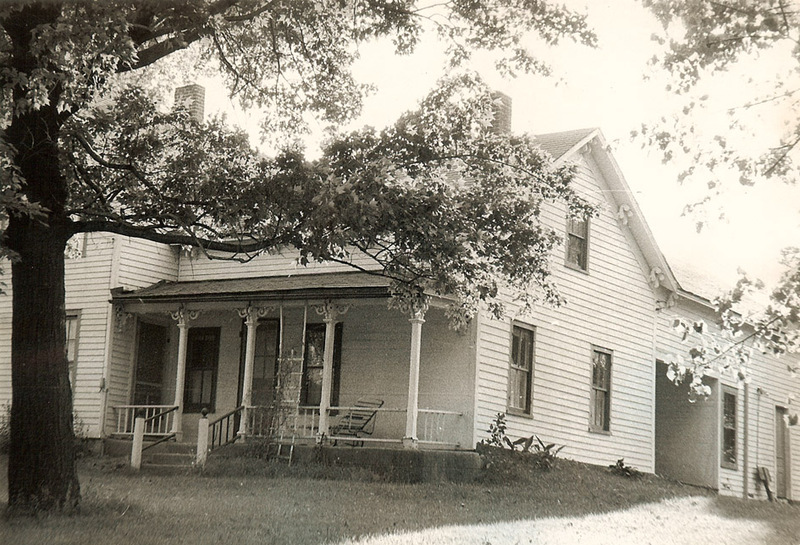 My mother and Henry bought this house about half an hour from Detroit about 1961. There was talk of moving there year around, but it never happened. We had a large garden and went up on weekends and for longer periods during the summer. We only owned 2 acres of the 40 acre farm, not including the barn. In 1967 someone bought the barn and started keeping chickens and pigs there, though they didn’t live on or near the property. The animals regularly escaped. The pigs dug up our garden and the chickens roosted on the porch. Before Henry and the man came to blows, they finally sold the house to the man with the animals. Looks like a competitive game. Your family is so unaware of the photographer. I don’t have many pictures like that. Of course, I don’t have the photographers your family has. Photographers must have become part of the landscape because I don’t remember photographers hovering over us taking continuous photos. This time Henry must have been taking the photos since Hugh is in them. Good story to go with the game; Great to have this photographs. I am sure my family played the odd game but nobody took ever a photo. Our family had endless card games of rummy, cribbage, pontoon and solo, for real money at times. But often the stakes were just tiddlywinks. Reading about the chicken and pigs made me think of Farmville which I keep getting asked to play on Facebook – so far I’ve resisted all invitations. I have to admit I played farmville for awhile. got so boring I took the fences down and let my animals roam among the orchards. Hopefully they didn’t destroy any nearby farm houses while I wasn’t looking. Oh I Always Love Your Photographs! This Week’s Are So Natural & Relaxed. Your family looks really happy playing together. That house looks like a great escape from the city. I can’t understand why anyone would keep pigs and chickens there if they didn’t live nearby. Maybe they were hoping my family would move and sell them the house. Doesn’t really make sense. Many regrets that I’ve just learned of your amazing blog. Looking forward to viewing more your “Independent Lens” series. 🙂 Thank you for sharing your amazing family history with us. Don’t regret, think about all those posts already there for you to look through. It is fascinating how the photographer does seem to disappear. Totally focused on the game, I would guess. Love the poker cloth on the table and all the canisters or whatever on the shelf behind you, Kristin. That house look really grand! It was a real old farm house and it was great. I kept telling them to just buy me the barn and they’d never have to buy me any other present for the rest of my life, but they didn’t do it. I see one can of bug spray up on that shelf. That wall paper was pink and green as I remember. Great house. Ah Kristin, another amazing set of photos. I feel like I was there at the game when these pictures were taken. I do think the man who owned the barn had his eyes on this house and probably used the animals as a way to push his point across. Beautiful place. Looks like good family fun. So did your aunt win all the time? She looks like she knew what she was doing. I don’t remember who won, but I do know I didn’t! Love the photos. Your aunt looks so serious. Did she always win? Oh what fun it looks like they all had! You have such a great family Kristin! Their poker game reminded me of a board game I used to play when I first got married called “Michigan Rummy!” We played for pennies but our coffee cans got very full and heavy and once one was filled on to the next can! My mother-in-law was a huge poker player. She would play everyday if she would find some players. We played every week-end when our children were small and still get together once a year for an adult game with my husbands siblings. I cannot believe I have not photos. However I was usually the photographer and I was not going to give up my poker seat for anything. We played for nickle and dime. Great photos. You have the perfect photos for this week! Oh, those good old days when you could smoke in the house, in front of the kids. I wonder if that was the neighbor’s plan all along, to talk you guys out of that awesome house. Thanks for sharing, I loved this post. Kristin, you seem to have a family photo for every SS theme! This one is is great; everyone trying to be ‘poker-faced’ and concentrating so hard. Reminds me of family game time…but no one took any pictures…As always I love your photos and the history!! Great pictures! + fascinating name for a road: ‘Old Plank Road’. Old Plank Road. Sounds like the title of a book. I love these photos. That’s a beautifully romantic house. Love these pictures! Reminds me of my childhood as my parents always played cards a lot especially with my aunts & uncles & grandparents. I wish I had pictures. Super snaps for this weekend’s Sepia Saturday theme. It looks like a nice dream house too. It was a big old farmhouse. It wasn’t as big as it looked because lots of it wasn’t finished. When we got it there was no inside toilet and that did get added pretty quickly. behind the porch that you can see on the side, was a room that Henry said was the wood room. It was big and unfinished and when the place was heated by wood I guess this room was full of the winter wood. There was an attic above this room that went over most of the rest of the house. There was a little…I should just do a post on the house. Buying a house means the neighborhood comes with. Pity theirs was so detestable. Everything was fine, the neighbors were far enough away we never saw them. Until the man bought the barn. If only they had listened to me. It’s all subdivided now. Love these poker photos–the concentration and expressions on everyone’s faces. 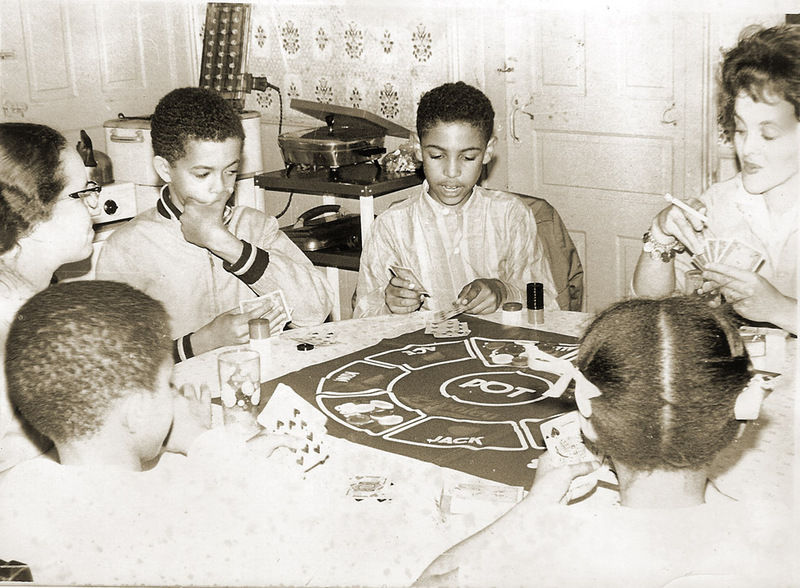 My husband’s family used to play penny poker–all four kids, their parents, and their grandmother–who had the real poker-face. My father-in-law still has a poker game one Friday every month. He does look like he’s up to no good as he checks out Ernie.